DESTINATION Kaiping City. Guangdong Province. PRC. PRICE HK$ 3300 per person for 4 days/3 nights. VACATION RATING Quite good. 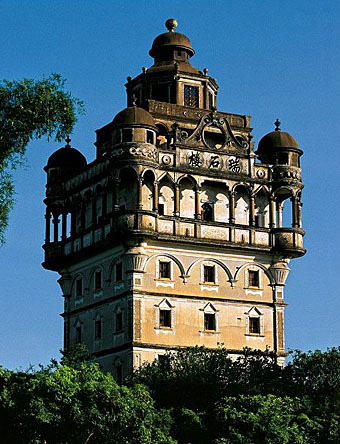 Kaiping Diaolou is a UNESCO World Cultural Heritage site with a unique blend of Chinese and Western architecture. This is not a lie on the beach, eat Thai food and drink margaritas kind of vacation. There’s lots of walking involved. With the right tour guide, it’s a great exploration of architecture, culture and history. GREEN RATING Quite Green. Travel by ferry (2 hours) and coach (2 hours). In Hong Kong, where we feel the need to fly somewhere for a vacation every few months, it’s great to find a worthwhile travel destination that is accessible by low carbon transportation. ORGANIZED BY Concorde Air-Sea Services in Central (852) 2526-3391 and the non-profit organization Friends of Diaolou. See the Visitors section of the Friends of Diaolou website to arrange a tour with English-speaking experts. The fee will go toward restoration of these heritage buildings. Note: If you have a foreign passport, you’ll need to get a PRC visa. Vacation destinations are much more limited when you don’t fly. I try to avoid flying because the carbon emissions from a round trip, short haul flight are about equal my total carbon emissions for the whole year. One trip would make all the effort we take to reduce our carbon footprint in our daily lives essentially meaningless. Discovering this UNESCO recognized destination so close to home was a great find. A quality tour guide is absolutely essential to this tour. After taking this trip, I really regretted visiting other historical destinations such as Rome, Machu Picchu or Angkor Wat without a proper tour guide. A good tour guide can explain the cultural, historical, architectural and social significance of the buildings and that changes the whole experience. Without this contextual knowledge, no matter how magnificent, they are just a bunch of old buildings. Since the particular tour we took was organized to celebrate the 100th anniversary of HKU, HKU also arranged for Selia – a university professor, HKU alumni and architectural conservationist – to narrate our site visits. Her combination of genuine enthusiasm and warmth, deep academic knowledge, and stories from her own childhood growing up in the area bring to life these magnificent old buildings. Our tour started with an outstanding lecture from her. The diaolou are multi-storyed defensive village houses in Kaiping, which showcase an intricate and flamboyant fusion of Chinese and Western structural and decorative elements. They reflect the role of the emigre Kaiping people in the development of the region during the late 19th and early 20th centuries. The diaolou can be grouped into three categories: communal towners built by several families and used as temporary refuge, residential towers built by individual wealthy families and used as fortified residences, and watch towers (though other diaolou served as schools or storerooms). Conflict in the Kaiping area drove the local men to migrate to the US, Canada, Australia and South East Asia in the mid 1800s. While abroad, they not only earned the necessary income, but also absorbed the knowledge and skills required to build such fantastical buildings. Facing discrimination abroad and longing to return, they sent money home to build these houses. Only the well-to-do emigres were able to return home. Many men got married, emigrated to work and never returned to see their families or the buildings that their incomes earned abroad had financed. On our tour, we also visited an unrestored town that looked like it was trapped in the 1920s. Walking through the streets you feel like you have traveled back in time. Wong Kar Wai filmed his Yip Man movie here. If you do not engage Friends of Diaolou to arrange your visit, we recommend exploring their website before visiting to put the architecture into context of the law, culture, economics and society of the time. In the mean time, lets get to the more practical aspects of travel. My curiosity was aroused when I read on our itinerary that we would be staying at the “five-star equivalent” hotel Pan Tower International. Promisingly enough, the sign at the entrance had 5 large red stars on it. There were two stores in the lobby, one sold RMB 1800 cashmere wool sweaters that looked like something my grandma would wear and the other sold wine. But there was no convenience store anywhere nearby. I soon learned what a five-star “equivalent” hotel is. It’s a hotel that looks like a reasonable facsimile of a three or marginal four-star hotel. The major hardware looks sort of right, but many of the details are wrong. The bed is hard and uncomfortable. The comforter is not wide enough for the bed. There are only plastic fruit in the breakfast buffet to remind you that you’re missing real fruit. But these are really quite minor quibbles, the place was fine. My mom, who considers herself a professional traveller, always tells me to bring peanut butter with me when I travel (on the assumption that you can find bread everywhere). This is one time I really regretted not listening to her. We ate what seemed to me to be the same Chinese food at every lunch and dinner. Each meal was at a different restaurant, but the food all had the same taste. By about the third or fourth meal, I was wishing for a plate of pasta or even just a peanut butter sandwich. The nightmare of every foreign traveller in China is of course, the washrooms. This being a UNESCO site, the washrooms were actually quite acceptable and not vomit inducing. It’s definitely preferable to use the washrooms at the heritage sites than at the restaurants. The tour really opened my eyes and helped me understand the lives and motivations of those that left China in the 1800s and early 1900s. This deep dive into into one corner of China is not only fascinating but also helps you comprehend what a wonderfully diverse place China is.